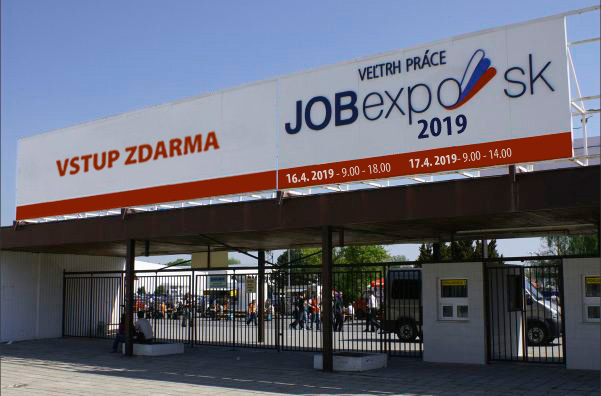 Central Office of Labour, Social Affairs and Family has organized the 9th annual job fair - Job Expo 2019, the largest job fair in Slovakia, in conjunction with the 21th annual international job fair - the European Job Days 2019. Event took place on 16th - 17th April 2019 at Agrokomplex - fair ground Nitra. 16th of April, Tuesday: 9.00 a.m. – 6.00 p.m.
17th of April, Wednesday: 9.00 a.m. – 2.00 p.m.
Foreign exhibitors used the opportunity to present their company to the public, many of them have choosed directly potential employees and established contacts with new partners. EURES Slovakia look forward to seeing you at the Job Expo 2019 in conjunction with the 21th annual international job fair - the European Job Days 2019. © JOBexpo.sk 19, all rights reserved.